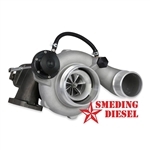 Cummins S400 single turbo kit. This kit comes with every thing needed to install the S400 series turbo on you 5.9 and 6.7 litter Cummins. Cummins S400 single turbo kit. This kit comes with everything needed to install a S472 single on your 5.9 or 6.7 Cummins. Cummins S300 single turbo kit. This kit comes with everything needed to install a S300 single on your 5.9 Cummins.